← An Eye on the Tropics. Here Comes Fay? Tropical Storm Fay has left Haiti with Cuba in her sights. 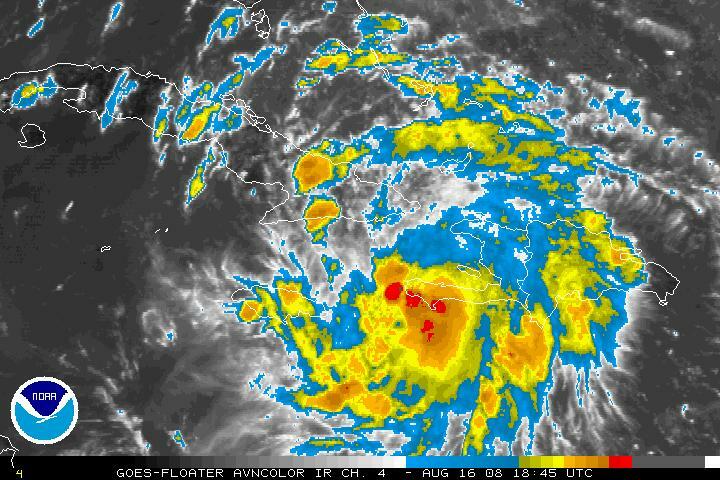 As of 2:00 p.m. EDT Fay was located just west of Haiti near 19.2 north, 74.9 west or 50 miles south-southeast of Guantanamo, Cuba. Maximum-sustained winds are near 45 mph with higher gusts, are mainly occurring over the water north of Hispaniola and are moving west at about 15 mph. Florida Governor Charlie Crist has declared Florida a state of emergency. Projections expect this storm to continue on its westerly path crossing over Cuba. Remember, the waters in this area are warm increasing the likelihood of Fay strengthening over water. Eventually, Fay will start to feel a weakness in an upper-level ridge to the north that now exists over the southeastern United States. This would start to turn Fay more to the northwest and then north. This is most likely to happen on Sunday night and Monday and would take Fay across Cuba and then back over the open waters south or southwest of Florida. 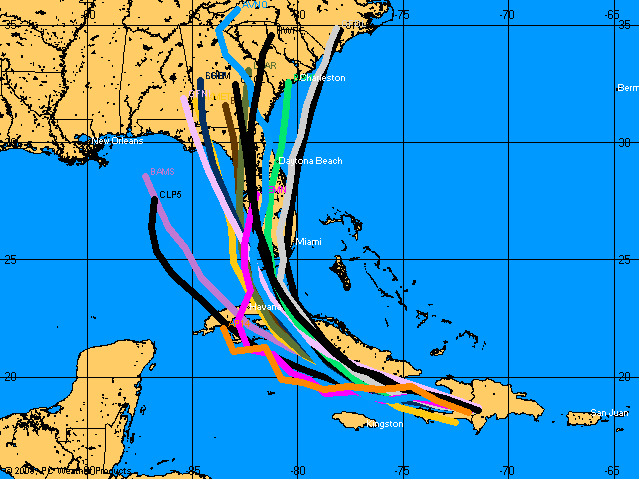 There is still a fairly widespread area of possible tracks according to computer models, from just east of Florida to the eastern Gulf of Mexico. The majority of them, however, indicate a path over the western portion of the Florida Peninsula. Although interaction with Cuba will have some effect on the strength of Fay, once back over the warm waters of the Florida Straits or Gulf of Mexico, additional strengthening can occur. Miami-Dade, Broward and Palm Beach Counties have opened School Hotlines where they will post emergency messages about Tropical Storm Fay. The school year is scheduled to begin Monday. No classes have been cancelled at this time. I am afraid that this storm will flood Hallandale Beach. Could it get to category 2?